The name says it all, Furminator as the name suggests stands for fur terminator and this miraculous tool not only helps to remove dead and loose hair from your pet’s coat but helps to reduce shedding as well in your pets. This innovative tool was the brainchild of Angie Portera professional pet groomer and her husband David Porter in the USA. They wanted an exceptional tool for their dog, which will be the perfect deShedding tool. They tried numerous products and when nothing worked they decided to make their very own product. This gave birth to one of the best shedding tools of all time the FURminator. This is one of the best tools in the world to remove a pet’s loose undercoat, safely and smoothly. It has now become the favourite tool for millions of pet owners around the world. Hence the tagline, ‘When it comes to shedding, we’ve got the EDGE’. The FURminator deShedding products were developed with the idea that the more hair you remove from your pet the lesser you will see flying around your house and car. 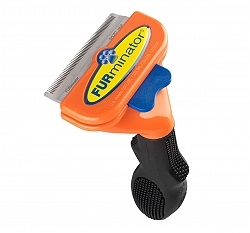 The FURminator deals with the problem of the undercoat with its patent technology. 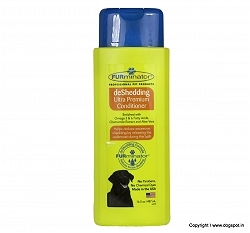 This ensures that the undercoat is removed of all loose hair without cutting or damaging the topcoat of your pet. This innovative tool helps to control shedding, it does not stop it completely as shedding is natural and there is no tool in the world that can completely eliminate it from occurring. 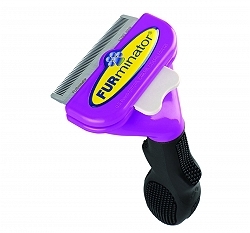 The FURminator helps to reduce your work of cleaning the floor, furniture and car seats. This miracle tools at times can reduce the loose hair by almost 90% in your house. The unprecedented success of the tool can be garnered from the fact that ever since its inception in 2003 the brand is now available across the globe and also every pet owner trusts FURminator products. The brand also manufacturers waterless sprays, dog shampoos and dog conditioners along with the de shedding tools. FURminator has been awarded with various patents as this one of its kind tool helps to drastically reduce shedding in your pet. In fact there are various patents pending in the US and the international markets for this innovative product. Once you get a FURminator home you will know that how miraculously your pet losses the extra hair while not only maintaining a healthy coat but ensuring that there less hair on your furniture and floors.